This week is all about something I’ve been sharing with my students a lot lately. We traditionally teach the blues scale or the minor pentatonic to beginning students and use them ourselves when we are searching for that traditional, ‘bluesy’ sound. The problem with this scale, in my opinion, is that it actually contains a lot of really horrible notes. 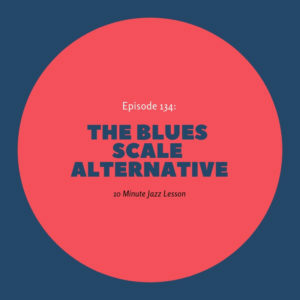 That’s why I came up with my own scale that I call, ‘The Minor-Major Pentatonic.’ This scale fits the chord structure of the blues in a much better way than the traditional scales we learn and does away with those sour sounding notes that deter many of us from going any further with improvisation. Tune in and hear all about it! I’m working through “Intermediate Jazz Improvisation” by George Bouchard. He refers to this scale as “altered pentatonic” and it figures prominently in the early chapters of the book. He also points out the usefulness of this scale over both the ii and V using the alt. pent. for the ii chord. Good stuff. Thanks! Wow, very cool. I had no idea that someone else was teaching this scale. That’s awesome! This was the episode that really “resonated” with me. I am just getting back to playing after a 25 year lay off. I became a Patreon member after this and bought the 60 days/Blues. Between your great work and Abersold I am feeling music again. Keep doing it! Awesome stuff. Everything you discussed including why inexperienced players hang out on the fourth finally made sense and why i didn’t like where I would land but really didn’t understand why it sounded bad. 😃🎺. Thank you for keeping jazz alive for all of us amateur jazz lovers. So glad to hear this! It keeps me going for sure. Glad you got something out of the episode and I hope you keep listening! Motivation Monday: I Want To Pay You To Practice!